Have you been holding your breath in hopes that Hollywood Studios would offer Star Wars Fireworks in October? What about Animal Kingdom park hours, will they get extended? I have some good news and some not so good news. Hollywood Studios will offer Star Wars: A Galactic Spectacular Fireworks in October BUT, they will NOT offer them nightly. At this time they are listed as being offered only 4 nights per week in October. On nights when fireworks are at 7:30 and Fantasmic is at 8:00, you could watch the fireworks, then make it over to Fantasmic (but you’ll be more likely to gain entry at Fantasmic with FP or dining package). When Fantasmic is first at 7:30 and fireworks are at 8:00pm, you’re out of luck for a good view of each. You might catch some stray fireworks above a tree or the projections on Great Movie Ride. Animal Kingdom has extended park hours through the month and which will continue the trend of allowing between 1 1/2 hours and 1 3/4 hours of after dark fun. Rumors have circulated that Rivers of Light may open as early as sometime in October, but it’s doubtful with these hours. If it does open during October, they will need to extend the hours even more. Magic Kingdom will cease having a night time parade on October 9 and nothing has been announced as a replacement. With Paint the Night guaranteed to stay at Disneyland at least through the holidays, either Walt Disney World will have no night parade or something no one has heard about will become reality. 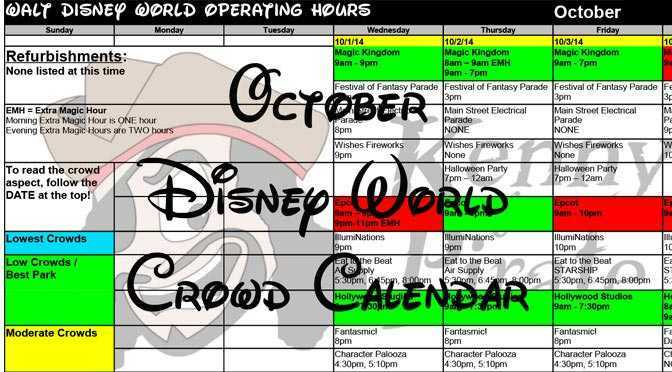 You can check all the October park hours updates on my October Crowd Calendar. Previous PostNick and Judy to join the “Creepa Crew” at Mickey’s Not So Scary Halloween PartyNext PostWhat’s the deal with Jasmine’s new costume? Hi kenny, I’m going October 19th this year, just notice that Disney has extended animal kingdom opening until 8:30pm. could river of light be on? Do you think the pattern of (Mon, Wed, Fri, Sat) will be the same in December? Fireworks could change to 7 days a week in October? I’m visiting HS on a day when it’s not scheduled and that really stinks. As you know, it’s so hard to switch days at this point. I doubt it will change again. KtP, if you had to guess, do you think the Nov days/hours for the Star Wars fireworks will be similar to October? I have a 3 night trip in early Nov and we were planning to be at HS on Sunday night. Now I’m trying to figure out if I should plan to hop to HS on Monday night to see the fireworks (based of Oct’s schedule). Thanks! Probably, but I would guess Thanksgiving week could have more. Kenny, What do you recommend for HS when the Fireworks are at 745pm and Fantasmic is at 8pm? Grab a FP for Fantasmic too?? Will they still have the Christmas parade? What’s the chance ak will extend their hours in November? Kenny, will the magic kingdom have a night time parade in September? Yes. Electric Light parade doesn’t end until Oct 9. I love how they “allow” you to make fp+ reservations 60 days in advance, up they won’t tell you their plans until closer to 30 days, or less. Very frustrating. thanks for all the info Kenny!